For many years I've been using the PuTTY network terminal to connect to remote servers when doing sysadmin tasks. And when I do, my monitors quickly fill up with those black windows. Remember web browsing before tabs? Like that. I totally lose track. The other thing that's annoying is that it does not let me categorize my saved sessions. All are in one alphabetical list. That might work when you just have a handful, but my list grew to dozens. Meh. With such an user interface of the site, it would be too much to expect gimmicks in the program. Yes there was an update. Security fixes. So I googled for what else there is. 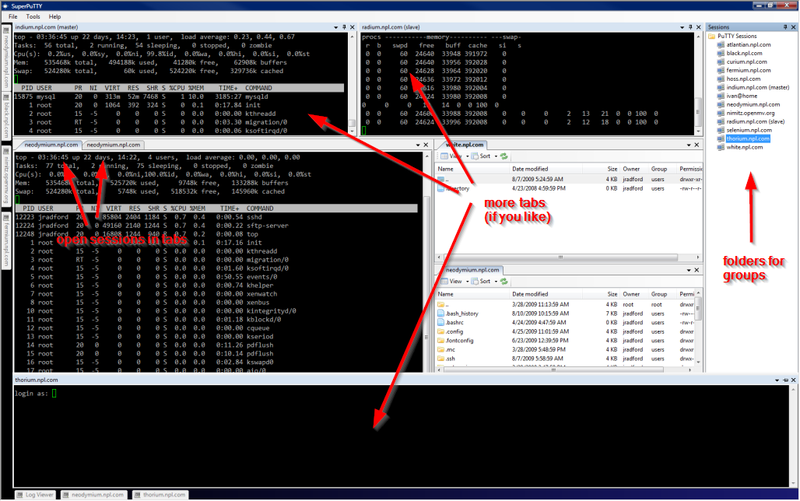 And apparently there are plenty of wrappers around PuTTY that bring exactly what I want: Tabs and Session Folders. I don't know how they could hide from me for so long - maybe because neither the official site nor the Wikipedia page mention any. Same putty, more gui. Awesome.